Eshelman Rd, Lancaster PA // Bathroom - Kreider and Diller Builders, Inc. DESCRIPTION: Renovations. This 1950s era two story home looked out of place in the prestigious Eshelman Road neighborhood. New porch columns, shutters, light posts, a stone faced addition, wood carriage house garage doors, and stamped concrete walks and patio and landscaping did wonders to the exterior. 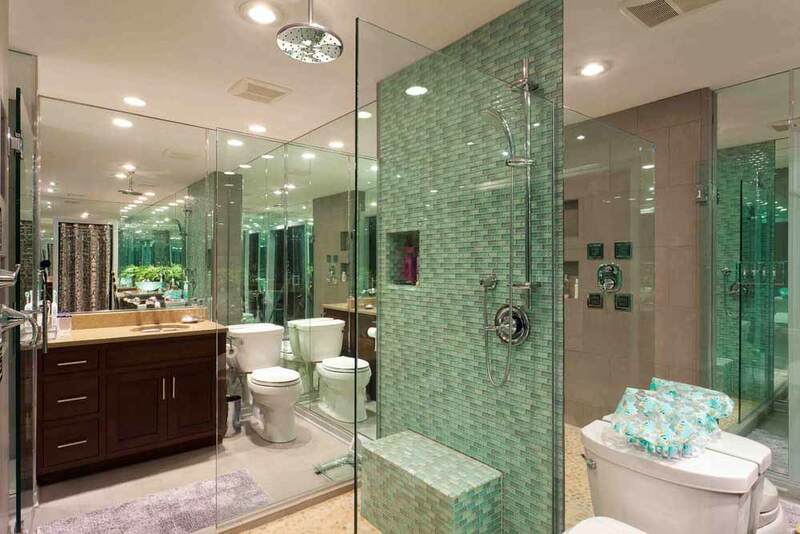 Inside, the Master Suite was expanded ten feet into the garage to create a beautiful mirrored and tiled His & Hers Master Bath divided by a tiled, glass-walled, shower. His & Hers walk-in closets, a coffered ceiling in the Master Bedroom, and a six foot opening with Shoji Doors to Her Master Bath and closet area were also added. Since the Master Suite was expanded into the garage a twelve foot addition was added to the garage using real stone that matched the fifty year old stone perfectly. The new garage, with its wood carriage house doors, also had a door added with space for the owner’s golf cart for convenient and stylish travel to the Lancaster Country Club. For entertaining, the small, knotty pine family room was expanded into the old jalousie windowed porch. The existing fireplace was retained, but is almost indistinguishable with a new face. The flat ceiling was removed allowing for a new sloped ceiling. There is a recessed area above the fireplace for a big screen TV and art work and new recessed glass shelving on each side of the fireplace with a wet bar alcove that complete the transformation.